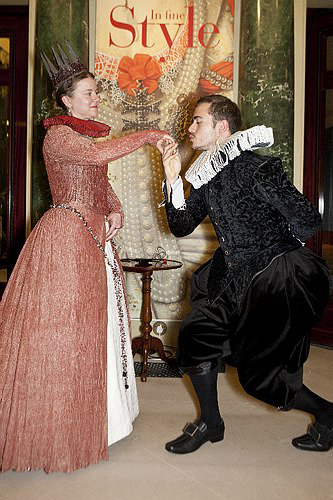 model Kelise (right) as Elisabeth de Valois (1545-1568), costume maker Alexander Connatty, at 'In Fine Style' at Queen's Gallery, Buckingham Palace, 18 May 2013. Image courtesy Thomas Butler. 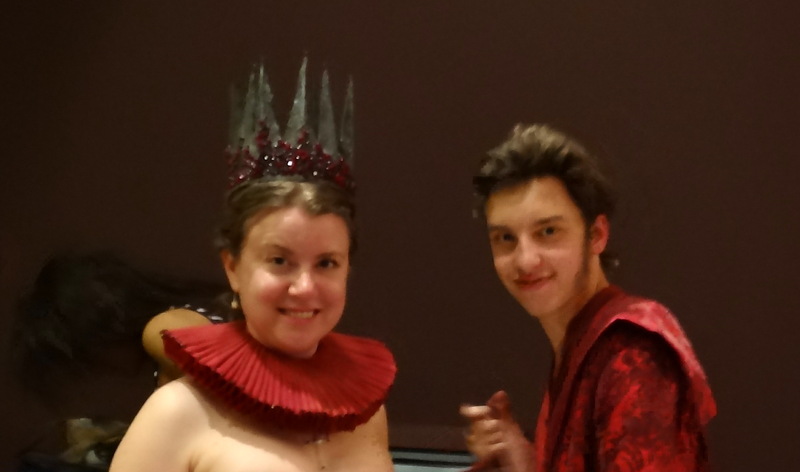 My friend Alexander is a costume maker/interpreter in his 3rd year at Wimbledon College of Art and Theatre Design. 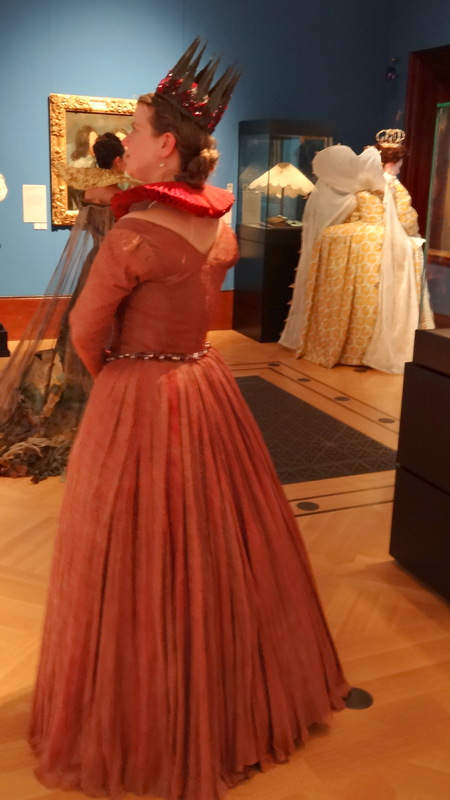 18 May 2013 was the date for the Costume Design and Interpretation 3rd Year Show, as part of the exhibition, “In Fine Style: The Art of Tudor and Stuart Fashion” put on by Royal Collection Trust at Queen’s Gallery, Buckingham Palace. For the show, Alexander dressed me as Elisabeth de Valois, (1559-1568) a French princess, sister to Mary Queen of Scots. Elisabeth de Valois, as styled by Alexander Connatty for ‘In Fine Style’ costume show at Queen’s Gallery, Buckingham Palace. (l-r) Henry the 7th, An Eccentric Old Woman, Earl of Wessex, and Elisabeth de Valois at ‘In Fine Style: The Art of Tudor and Stuart Fashion’ at Queen’s Gallery, Buckingham Palace. 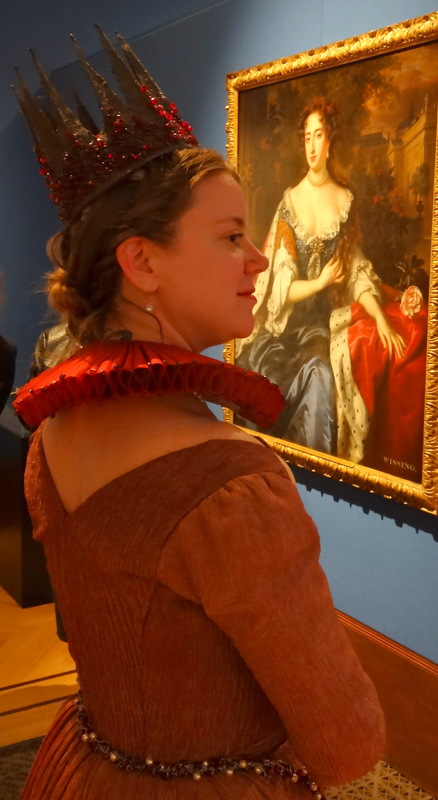 For this project, over 100 students worked to create historically accurate Tudor and Stuart fashion (mid-late 16th and 17th century), which culminated in a costume parade/show at the Queen’s Gallery, adjacent to Buckingham Palace. The exhibition itself contains many Tudor/Stuart portraits on queens, kings and other great persons of the era — all dressed in sumptuous fashion of the time. Besides the portraits, there are a great many artefacts – shoes, lace collars, and jewellery, along with designs and descriptions of how the clothing was made and who might have worn such articles. Showing extensive hand-pleating in the skirt. Gown made by Alexander Connatty. Image courtesy Thomas Butler. My part in all this was to perform as Alexander’s model in the character of Elisabeth de Valois (1545-1568), which only ended with me wearing the gown for the show, having started months before with various measurement and fitting sessions to get it just right, while it was also made historically accurate, according to period techniques and designs, with a twist. Alexander was making, in his words, “an Iron Queen” as befitting the lead character in the opera Don Carlos, a queen forced to choose between her lover, the Prince of Spain and his father, the King of Spain, whom she would marry. Elisabeth de Valois, made by Alexander Connatty, model – Kelise Franclemont. Image courtesy Thomas Butler. In the end, Alexander made this American girl look positively regal in a red shimmering gown, a hand-embroidered petticoat with hundreds of French knots that shone like pearls, girded with a chain of garnets and more pearls. The look was topped with an iron crown graced with handfuls of the dark red gems, making me feel a little bit wicked, and truly spectacular. In the dressing room (l-r) Kelise Franclemont as Elisabeth de Valois and Alexander Connatty, who is wearing a coat of his own design. Image courtesy of Kelise Franclemont and Thomas Butler. Alexander Connatty’s online shop, Harlot’s Diary, where clients can order bespoke fashion and costumes for both men and women. Exhibition details: The exhibition “In Fine Style” runs from 10 May 2013 to Sunday, 06 October 2013 at Queen’s Gallery, Buckingham Palace Rd., London, SW1A 1AA. Fee entrance, concessions.